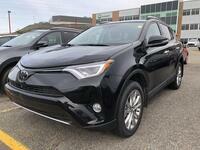 This outstanding example of a 2019 Toyota RAV4 Trail is offered by Saint John Toyota . Want more room? Want more style? This Toyota RAV4 is the vehicle for you. This AWD-equipped vehicle handles well in any weather condition or terrain. You'll benefit from superb handling, improved steering and excellent acceleration. This vehicle won't last long, take it home today. This is about the time when you're saying it is too good to be true, and let us be the one's to tell you, it is absolutely true.